Important Note: Since WPJB version 4.3.0, you can enter keyword, description and any other meta data like for any other WordPress Post. In order to access this options go to wp-admin / Job Board / Jobs panel, edit any of your jobs. In right sidebar you will see “Advanced Options” button, click it, it will take you to a panel where you will be able to enter SEO data. 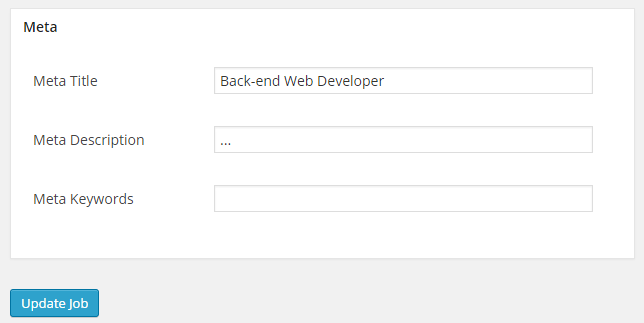 Installing this addon will add “Meta Title”, “Meta Description” and “Meta Keywords” fields to Job, Company and Resume forms. In order to use this addon you will need to have both WPJobBoard and Yoast SEO plugin installed. Note that the meta fields will be editable from wp-admin panel only, if you would like to make the editable in the frontend you will need to uncomment three lines in the addon source code (the lines which need to be uncommented are marked, so you should not have problem finding them if you know PHP basics). I have yoast seo plugin installed and when i click the advance option, it displays meta description and keywords but i notice today that when i click advance option it display this message “You are not allowed to edit posts in this post type” please how do i access the meta description and keywords?? Good day Greg, Please how do i make the meta description and keywords to work? ?